In this Slate commentary, Tim Hartford explores the Starbucks strategy for price discrimination. Price discrimination occurs when a firm charges different prices for the same product. Because the product is the same, the price difference does not reflect difference in cost, rather it reflects differences in consumer willingness-to-pay. In the end, this pricing strategy works well for Starbucks. The firm keeps price sensitive cappucino connoisseurs coming back by offering (covertly) the less expensive, higher-quality 8-ounce drink. At the same time, Starbucks rakes in the maximum mark-up from unenlightened customers who willingly pay a bit more to quaff the super-sized cappucinos. 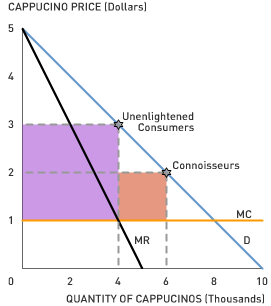 Price discrimination requires three conditions: market power, differences in consumer willingness-to-pay, and the ability of the firm to segment the market into consumers with high willingness-to-pay and consumers with low willingness-to-pay. 1. What type of firm is Starbucks: perfectly competitive, monopolistically competitive, oiligopoly, or monopoly? What is the source of Starbucks's market power? 2. Hartford claims that Starbucks's marginal production costs are the same, regardless of beverage size. List some of those costs. 3. What strategy does Starbucks use to split the market into consumers with high willingness-to-pay and lower willingness-to-pay? 4. What would happen to the company's profit margin and consumer base if Starbucks refused to make short cappucinos altogether? 5. Think about the other examples of price discrimination that Hartford cites. How does Tesco, the British grocer, price discriminate? Do you see similar tactics in American supermarkets? 6. What strategy did railroads use to segment their market? Were railroads really charging different prices for the same product, or does the roofless car represent a different product altogether?